Sensors that can count Items, Fluids, Energy and Time. Valves to control flow of fluid and energy. LED-Displays and Oscilloscopes to monitor the state of your machinery. And some devices to transmit and manipulate signals including compact programmable circuits. signals transmitted with efficient constant time performance no matter how long the cable is. Shows an example setup for a circuit that increments an internal counter each redstone pulse at input 1 and resets it to 0 when input 2 is on or the counter reached 25. It emits at output 1 when counter is at 0 and at output 2 when it is between 12 and 17. 5. Put both jar-files (mod and lib) into the mods folder of your installation directory. Its strongly recommended to install the NotEnoughItems-Mod, too (Mod Page). This mod will show the crafting recipes of Items. Note: NEI has not been updated to 1.8.9 so use JustEnoughItems instead then. You are allowed to use this mod for any modpack or server you wish. If you are providing a copy of this mod somewhere else that is public available (public modpacks for ex. ), please mention the Author somewhere and provide a link to where you originally got the file(s) from. This mod is mainly meant as Redstone Control Add-on for larger modpacks, as some features like the Sensors and Valves only make sense if there are mods providing energy and fluid storage/transport systems. The extended range for possible redstone strength values should not be a problem with other devices (unless a mod author has the great idea to make something like a power generator that produces energy for free at a rate based on signal strength and forgets to limit it). In most cases machines will only care whether the signal is on (>0) or off (<= 0) anyway. Note: search the fml-latest-log for the keyword 'ScriptException' afterwards, just in case you did something wrong. This is also the perfect time to share your opinions about what bothered you in Automated Redstone that should be made different in the new mod, as well as what features you liked the most that must definitely come back in some form. How to attach levers and redstone torches to cables? I tried rightclick and shift-rightclick but both failed. 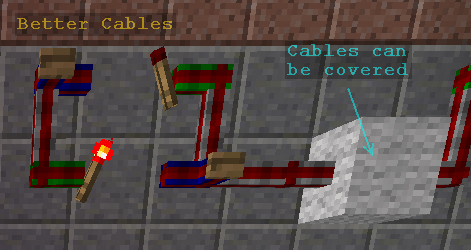 Is the first image in project page shows me lever and button can be directly placed on cables, or they are in fact placed on some invisible block covers? However the trick is to cover the cable with a block so that all sides become solid. Then place the torch and after that you can remove the cover again because it will sustain itself. The problem is once I removed the cover by left click, it did not sustain and stuff attached drops. In 1.12 Minecraft is now using a different method to determine placability than the solid face logic it used in 1.11 where I made the screenshot. Can confirm it works in 1.11.2, but I prefer to wait for a release of the new mod now. One problem I am having is the 7 segment display, when viewed at certain angles I can't see anything on it, all the colors become one. Even then when I can see it correctly. I still find it hard to tell the colors apart. Would it be possible to update the textures for this block? I've adjusted colors, obviously. But it still blends. The contrasting colors can match the set color. Other than that, the lack of a wiki makes this a bit difficult. When I played minecraft a decade ago when I was a kid I could build calculators with redstone. Now I can hardly remember how I did any of it. Trying to pull information I haven't used in a decade is a bit difficult. But I suppose that's an issue with me. Despite that, I'm hoping someone will make a wiki. A wiki with the most common circuits. I don't quite get what you mean with the color thing, could you please post a screenshot (preferably as an issue on Github) because I have the feeling that something with the renderer is not working correctly. Example circuits can be found here. I thought I had already linked that one but apparently not. Can you direct me to any Wiki or other source of info on this mod. I know it would be of great use to me if I knew more about it. I would like to set up a timer that when activated would count up until it receives a second redstone pulse, then reset when given a third pulse. 1. Would this work with Applied Energistics? 2. In the picture above, what mod are the energy storage blocks from? To 1: What exactly do you want to work with Applied Energistics? If you want to read out its contents (the amount of a certain item) as redstone signal you can use an Item Sensor on an AE block that exposes the network content as inventory (if such a feature is supported, I heard that ME Interfaces can do that). The normal ME level emitter can only do comparison but not emit the exact amount as signal as far as I know. To 2: In that demonstration setup I used Capacitor Banks from Ender IO but the Energy Valves should work with any capacitor that uses FE (Forge Energy) and the Energy sensor can additionally read IC2 electric power (the Energy Valves don't). Thanks for the reply! I would mainly want it to work with AE's ME network so thanks!! My program divides the # of buckets of water in an Ultimate Fluid Tank from Inductive Logistics by 20972 to get a percentage of how full the tank. But it gives random numbers. also would be sweet if you could use Hexadecimal for constants, and how can you split up an 8b input? Yea, that automatic constant insertion might be a bit too aggressive in some cases. But remember you can always connect a component to itself to prevent spawning constants (unless the component's bit size is smaller that its connection). Also an easy way to quickly clear the board is clicking the load schematic button without having an item in the slot (or with a schematic that has nothing written to it yet). I actually added hexadecimal and binary notation support for constants today before I read your comment (what a coincidence). You can split 8b values into individual bits using the bit picker option that is available on the logic inputs of most components (left button above label/constant value text field: default mode is zero/else discrimination, next is usually bitwise operation (if supported), and another click leads to pick bit 0, then pick bit 1, ... pick bit 7). Unless you want to use that bit to feed logic inputs anyway, you could isolate it using an OR or AND gate with only one input that is configured to pick the desired bit. well you cannot get rid of constants if the componend connected to it only has an input (like the Output). aparently i'm blind or something, i never saw something like a bit picker i need to look for that. thanks for the HEX values! wait, i cannot find the bit picker... where is it? As I said the bit picker option is not a module itself, its an option on a module's input. Just place down any module that has logic inputs (the red sockets) and select it (gets red frame around it). The 2 buttons next to the DEL-button should then show icons instead of being blank. Just click the left most button a few times and you'll be enlightened (hopefully).